Lupus is a chronic illness which can have damaging effects on many parts of the body as the immune system targets the body's own cells. What many people don't realise is that it can also cause Hair Loss. In fact, this is often one of the first symptoms to appear, and it's one of the reasons why unexplained early onset hair loss should be discussed with your doctor. So how does hair loss happen in lupus, and what, if anything, can you do about it? Almost half of people with lupus suffer from hair loss at some point during their illness. The good news is that the worst of it usually occurs early on, so by the time you have a diagnosis it's unlikely to get drastically worse. It usually causes fairly even thinning of the hair, and it's very rare for all the hair to fall out. The immune system attacks the hair follicles. This can happen without any pain, so the first you may know of it is that you start finding more hair coming loose when you brush or shower. Because follicles may weaken without actually dying, switching to gentler hair care products and brushing rather than combing can help, as can switching to a shorter style that puts less stress on the roots. The immune system attacks the skin on the scalp. This is usually itchy and sometimes painful. A friend examining your scalp will be able to see a reddish rash. You may find flakes of skin coming loose. Talk to your doctor about your treatment options. Untreated, this can lead to patchy hair loss, especially if you scratch. Try tapping instead of scratching, as it should soothe the itch. The hair receives inadequate nutrition due to poor general health. 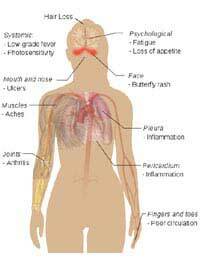 Often lupus sufferers also have gastric problems which can lead to poor absorption of vitamins and minerals from food. In this situation, the body treats the production of healthy hair as a low priority. Your local Well Woman or Well Man clinic can advise on how to change your diet to improve your hair, and your health. If all that sounds bad enough, I'm afraid there's more – many lupus patients, including those who don't suffer from hair loss caused by the disease, experience Hair Loss Caused By Their Medication. There are several different routes to treating lupus (all aimed at managing the symptoms, as there is presently no cure). Doctors have to try to find the right one for each individual patient. To do this, they need to know how the patient prioritises their treatment. If hair loss is a big issue for you, don't be afraid to mention it. It might not seem as serious as, say, joint pain, but if it causes you ongoing distress, then your doctor will want to take it into account. The good news is that many patients will be able to switch to other forms of medication which are kinder to their hair. Most lupus patients need to take steroids at some point, and these can be hard on the hair, but your doctor will want to minimise your steroid intake anyway, to protect your general health. The important thing is to keep talking about it. Some people with hair loss caused by lupus find that going on medication to treat their other symptoms solves that problem, too. Where medication causes hair loss, the effect often becomes less severe over time. If you're worried that your hair is thinning because of your lupus, you may be tempted to try a hair restoration product like rogaine or finasteride. It is very important that you do not do this without talking to your doctor. Because of the way hair restoration products of this type affect your hormone balance, they may actually make your lupus worse. They may also interact badly with your prescribed medication. Some ointments used to treat a damaged scalp, including natural ointments containing tea tree oil, contain natural steroids, so they should be used with caution if you are also taking prescribed steroids (although you put them on the outside of your body they can still seep through and enter your bloodstream). Tell your doctor before starting a treatment like this. The best way to protect your hair if you have lupus is simply to give it lots of care and attention. Many people find that moisturising shampoo helps, and Gentle Scalp Massages can contribute to keeping the follicles and skin on your scalp in good condition.